Tell us a little about your Baton Rouge Story. What brought you to Baton Rouge? I grew up in Baton Rouge and – to be honest – always dreamed of leaving. I thought I had seen everything Baton Rouge had to offer (but what did I know, I was still in high school). I left for college and upon returning, I was hoping to just be here temporarily until I got a job out of state. As it so happened, all 30+ job applications I sent out got either rejected or ignored (go figure). So, I started looking for a job here in Baton Rouge, reaching out to anyone I knew or sort of knew just to get a foot in the door. Fast forward a while and, with the recommendation of a friend and mentor, I landed a job at an agency that I had been pursuing for a year! It wasn’t long after that I started to realize just how vibrant of a community Baton Rouge really is. Tell us more about how you’re involved in Baton Rouge. I’m a Principal and the Director of Digital at MESH, a full-service creative and strategic agency that helps businesses transform their company through things like management consulting, business strategy, branding and marketing. I also created a podcast called altBR with my friend Abe Felix that tells the stories of the folks in the trenches making Baton Rouge a better place. That little show gave way to a podcast network and production company we founded called Parachute.fm that now has three shows that we produce, all with the mission of progressing social good. Aside from my “jobs,” I’ve served on the board of a local charter school, Mid-City Maker’s Market and Dream Teachers and volunteered with a variety of local organizations including CASA, Futures Fund and Junior Achievement. What is your favorite thing about Baton Rouge? I’m sure everyone would say the same thing, but my favorite thing about Baton Rouge is the warmth and genuineness of the people here. During the flood of 2016, family, friends, acquaintances and even total strangers gave us food, gave us a place to stay, let us borrow tools and equipment, gave of their time and money and helped us get things back to some sense of normalcy. And not just us — those stories can be found all over this city. I had friends from all over the country telling me how impacted they were with the kindness of our neighbors. What is your dream for Baton Rouge? To see our city own its identity to the fullest extent. To celebrate change and progress. To embrace the new and innovative. To empower the people who want to make a difference. To love more and give more of ourselves to the people and cities around us. How are young professionals like yourself shaping Baton Rouge? All around Baton Rouge, people are stepping up to see change happen because there’s a need and there’s an opportunity. I’ve been blessed to interact with (at this point) over 90 of Baton Rouge’s movers and shakers through altBR, and a large percentage of them are 35 and younger. They’re starting businesses, organizing events, creating art, founding non-profits, spearheading community initiatives and building things that make you proud to be a part of this city. What would you say to someone considering a move to Baton Rouge? I say this all the time: Baton Rouge is one of Louisiana’s best-kept secrets. It’s a melting pot of creole, Cajun and experimental cuisine, Blues, Jazz and Zydeco music, festivals and parades, Southern architecture and modern developments, internationally known conferences and creative events, public art and modern art, swamps and concrete jungles and, of course, people from a variety of ethnic backgrounds. What is your Baton Rouge favorite? Way to give back: Get out of your house and go to the events all over the city! I talked to someone yesterday who has been here five years and hasn’t made it to Blues Fest which is a shame because people fly in from all over the world to attend. If we show up, it supports and encourages culture, the local economy and the organizers who want to bring something great to the city. With significant job growth, a bustling arts scene, delectable cuisine, abundant outdoor activities and more, the Capital Region attracts talent of all ages, including young professionals. Whether straight out of college or looking to establish their own business, more and more young professionals are choosing to lay their roots in Baton Rouge. 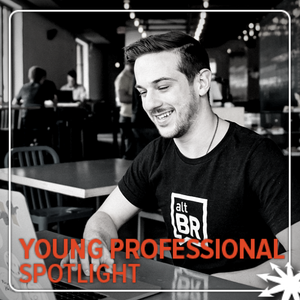 Each month, BRAC highlights one of these young Baton Rouge Area movers and shakers in the Young Professional Spotlight.